Many moons ago, during the 2005 NFL draft, EA Sports unveiled a teaser trailer showcasing what to expect from the Madden series when it would make the leap to next-gen consoles. After the target video aired, gamers and journalists alike were left in awe and eagerly anticipated the release of the 1st next-gen title in the storied Madden franchise. 7 Months later, coinciding with the launch of the XBOX 360, we were introduced to Madden NFL 06. It was fresh and flashy in all it’s high definition glory, but the overall experience felt sub-par and no where near what the teaser video had displayed earlier in the year. Since then Madden players have waited (some more patient than others) for the series to meet the high expectations it had set for itself. Fast forward to present day, and I can now say with confidence that EA Sports, have not only reached that target render from 5 years ago, but have also completely outdone themselves along the way. Next gen football is finally here, and it’s name is Madden NFL 10. 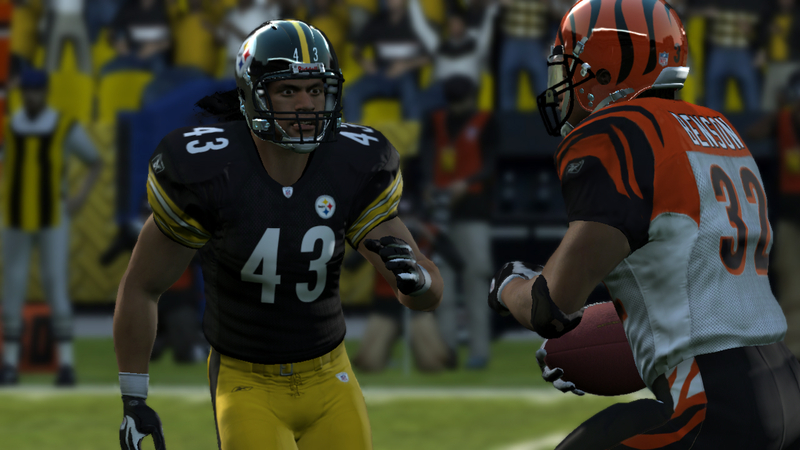 Madden NFL 10 is all about the details. The presentation is the closest thing you’ll get to watching the big game on Sunday. The visuals are so striking that while playing the game for this review, I can recall my girlfriend coming into the room and asking if I was watching an NFL broadcast. This was due to the fact of how good everything looks in motion. The player’s interactions in between plays, along with the head coaches pacing up and down the sidelines really add something special to the game’s overall polish. Watching irate fans getting out of their seats to heading for the exits during a blowout is classic. The authenticity is insane, as you’ll find new things you hadn’t seen in almost every game. With all of the good there is some bad. As there are a few very minor bugs and texture issues present. On top of that many of the player’s faces don’t quite match their real life counterparts. 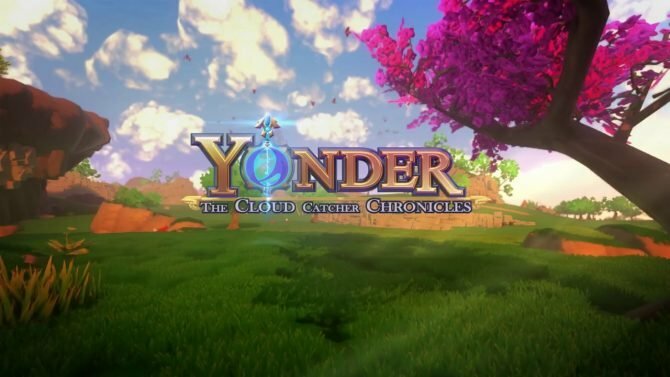 It’s a slight annoyance but not enough to take away from the game’s overall experience. All of your favorite modes make their yearly return. Franchise is back, but just a little trimmed down and streamlined this time around. It isn’t based on the usual calendar schedule, so that means no more scheduling practice time for your squad to prepare for your next game; but need not worry as all of the other facets found in previous versions of Madden are still there. Superstar mode has made its return as well, but it’s not the same as I remembered. During practice you’ll find yourself grinding out the same play over and over, without ever benefiting your created player at all. There is no more mini-camp mode, which is also a little disheartening. 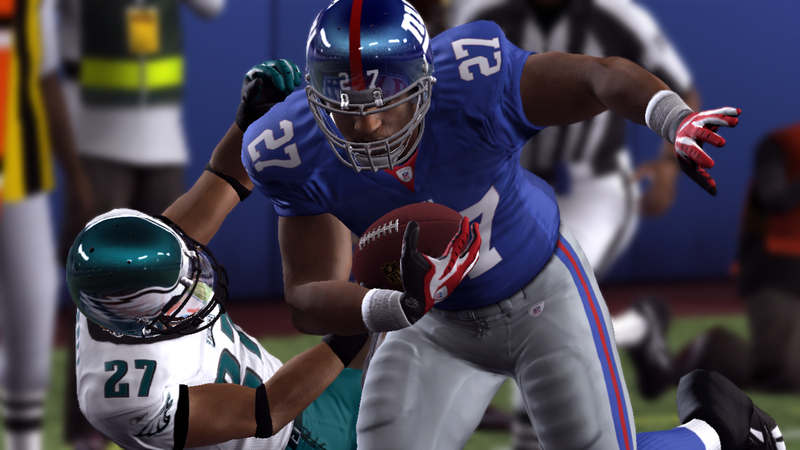 The game play in Madden NFL 10 is what immediately draws you in. Some people have been saying that the game seems “slower” than 09, but game speed is something that can be altered to your liking. I left the speed on it’s default setting for the most part just because I found that running the ball felt so natural at that speed. Changing direction and cutting is done effortlessly and to great effect. Bringing the game speed up a notch along with the difficulty setting and this years Madden turns into the most intense pigskin game of all time! For the first time in the series, (just like in real life) it feels as though the play is never dead until the referee blows the whistle. If a defender grabs on to you while your running the ball and doesn’t wrap up, a little wiggle on your highlight stick can set you free. Some will argue that allowing the Half-Backs to be so elusive makes the running game feel cheap or too easy, but don’t worry as there’s a perfect remedy for that and it comes in the form of real time gang tackling. The real time gang tackling or Pro-Tak System as it’s called allows for 3-9 players to engage and take down a ball carrier at the same time. The use of this system is key, especially if you’ve played previous games in the series and can remember how ball carriers, no matter how hard they were hit always had a tendency to fall forward. Those days are thankfully over; as a defender you now have the ability to use your hit stick to push back the gang tackle pile and hold your defense’s ground. This provides the perfect opportunity to then glance over to your opponent and pound your chest in victory! If the ball is jarred loose while in a gang tackle pile, you enter what is called a “Fight for Fumble” mode. This mode is 50% quicktime event, 50% button-mashing fest, and 100% fun. 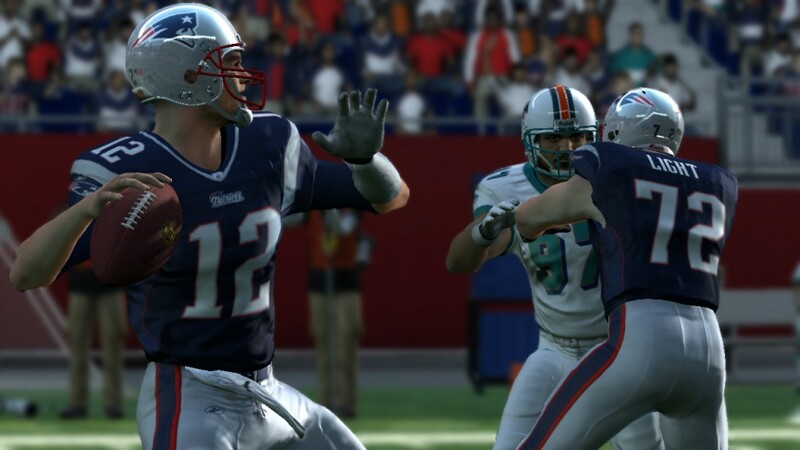 When Madden loyalists first caught wind of this feature, online forums exploded with fears that the game would go into this mode on every fumble. Let me be the first to assure you that it does not. The game is pretty good at judging what kinds of fumbles activate this mode. There would be many instances, where I wouldn’t see this mode activated more than once in a 5 game (or more) stretch. Graphically is where I think Madden makes it’s biggest leap. The addition of depth of field filters is what makes the graphics really pop out of the screen. Mix that in with some real-time lighting, weather conditions, and a (for the most part) rock solid frame rate and you’ve got some serious sports game eye candy. MLB: 09 The Show set the bar for graphics in a sports game, and Madden NFL 10 has just raised it. The sound in Madden NFL 10, is in a class all it’s own for a sports game. With true Dolby Digital 5.1 directional sound, it’s as much a feast for your ears as it is for your eyes. Constant on field chatter, and bass heavy hits will keep you entertained throughout every game. The play-by-play commentary, or voice work in general is another story. It’s actually quite funny when you think about it, because most Madden players will tell you how much they hated listening the play-by-play commentary (from the big man Mr. John Madden himself) and usually turn it off with any chance they get, in Madden NFL 10 however, it seems as though their isn’t enough or at least not of the same quality. You get a nice half-time highlight show, but it seems a bit incomplete as there is no one talking about what it is you’re watching on screen. Again I’m just nitpicking, it’s nothing that takes away from the overall game. Online play (from what I’ve played so far) is super smooth. I don’t know how that will change after the game’s launch, when the servers are getting hammered by millions of players. As it stands now, you can expect an enjoyable almost lag-free experience. For the 1st time there’s now an “On-Line Co-op” mode but due to some funky camera angles (as it zooms in and pans more on the 1st player) I don’t think this feature will be fine-tuned or at least play the way it should until next year. Making it’s return this year is “Online Franchise” mode, which should help keep all the fantasy freaks busy for the next couple of months. The experience does not end when you turn off your console. PlayStation 3 owners who also purchase the game for the PSP have the ability to design plays on the handheld, test them out, and then upload them into the PS3 version. It’s a cool feature that allows us all to bring out our inner Bill Belichick while on the go. Apple iPhone, and iPod Touch owners will also get in on the mobile action. 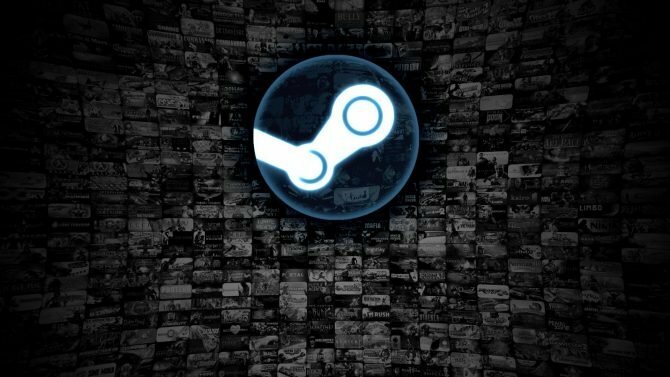 Coinciding with the game’s launch on August 14th there will be an App available for download that allows you to manage your online franchise. With the low price of: free, there’s no reason to not pick up the App. In closing, Madden NFL 10 is the next-gen football game we’ve all been yearning for ever since that teaser trailer in 2005. It’s by far the best bang for your buck as there is plenty of football jammed into this nice complete package. With that said the only question that remains is: are you ready for some football? If so, do yourself the favor and pick up not just the best football game ever, but also one of the best sports games ever.